As the second president of Egypt to stand trial for the killing of protesters, there are important questions to be answered about the trial of Mohamed Morsi due to start on 4 November 2013. What charges does Morsi face in this trial? Morsi is charged with incitement to commit murder and violent acts during protests at the Ittihadiya presidential palace on 4 December 2012 during clashes between Morsi supporters and opponents. The clashes resulted in the murder of eight people, including at least four Muslim Brotherhood members, as well as journalist El-Hosseini Abul-Deif. Hundreds were also injured in the clashes, and there were reports of protesters being tortured. What is the maximum penalty Morsi faces? According to lawyer Mahmoud Ahmed of the pro-Morsi National Coalition to Support Legitimacy, the maximum penalty for the incitement of murder is the death penalty, or in some cases a life sentence in jail. Who are the other defendants alongside Mohamed Morsi? In addition to the deposed president, 14 other people will also stand trial, including: former deputy chairman of the Freedom and Justice Party Essam El-Erian, former deputy chief of staff of the presidential palace Asaad Shiha, former presidential office manager Ahmed Abdel-Ati, former presidential advisor Ayman Hodhod, leading Brotherhood figures Mohamed El-Beltagy and Alaa Hamza, Islamist media figure Abdel-Rahman Ezz, Islamist youth figure Ahmed Mogheer, Salafist leader Gamal Saber, and Islamist religious figure Wagdy Ghoneim. What is the difference between Morsi’s trial and Hosni Mubarak’s trial concerning the killing of the protesters? Mubarak stood trial because he did not protect or stop the killing of peaceful protesters in the early days of the January 25 Revolution. Morsi is charged with inciting his supporters from the Brotherhood to attack and kill opposing protesters. The defendants in Mubarak’s case included officials from his administration, mainly from the interior minister, including former interior minister Habib El-Adly. The defendants in Morsi’s trial include leading Brotherhood figures and Islamist supporters, aside from former officials in his administration team. Will Morsi stand trial on other charges? This is the first time the ousted president has been referred to the courts since he was removed from power on 3 July. He is still being investigated by the prosecutor's office on other charges, including espionage and the killing and abducting of soldiers and policemen. Will Morsi appear in court on Monday? It is unclear whether he will attend the first session of the trial. Some news reports say he might not be present for security reasons. A video conference may be used to avoid security concerns. However, according to lawyer Mamdouh Ahmed, Morsi is required by criminal law to attend the first session of the trial in person. What about the defendants who have not been arrested? In accordance with Egyptian criminal law, those defendants who do not appear in court will be tried in absentia. Mohamed Morsi is said to not to recognise the court’s authority. How will this affect the trial? According to established legal procedures, the judge will ask the defendant in the first session of the trial if he will be represented by a lawyer or if he would like the court to appoint him a lawyer. If he refuses to answer, the judge has the right to appoint a lawyer to represent the defendant. 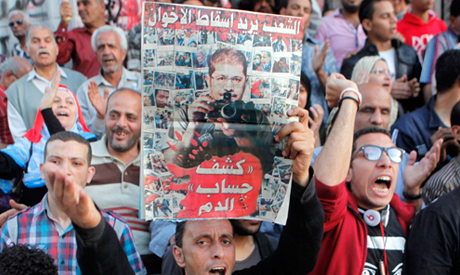 What happened during the clashes in front of the presidential palace on 4 December 2012? Clashes erupted between Morsi supporters and opponents over a constitutional declaration he issued in late November 2012, immunising his decisions from court appeal. During these clashes, pro-Morsi protesters attacked and violently dispersed an anti-Morsi sit-in in front of the Ittihadiya presidential palace on the morning of 4 December 2012. Throughout the afternoon and into the following morning, pro- and anti-Morsi protesters clashed, resulting in the death of eight people, including four members of the Brotherhood and four anti-Brotherhood protesters. In addition, hundreds were injured, including a number of anti-Morsi protesters who were filmed being tortured at the gates of the presidential palace by Brotherhood members. During the clashes, Brotherhood leaders called for popular mobilisation to protect what they saw as an attack against the elected president. Oh, I think a tree fell outside my home. Maybe Morsi should be tried for that too ? This is absolute garbage. 8 people killed, 4 of them MB supporters and the MB is being tried for it. 1000+ people , most of them civilians killed by security forces snipers and all of them are conveniently called terrorists and no one is even investigating that ? Just remember that God doesn't take sides: He gives justice, whether in this life or the next. If innocent people are wronged, whoever they are, they will be given justice. WHY DO WE NEED A TRIAL??? Has US had a trial for the terorrists at GUANTANAMO?? Just let terorrist puppet rot in jail. All he intends to do if given a chance is increase violance and devide the country further. What about Mr. Morsi prison beak escape? Is this case charge will not appear at the court? Ahram was against Mursi from the very inception. Ahram was against Mursi because of his Islamic ideology, not because of his policies. Ahram is simply too un-Islamic and too secularist and too un-objective to be honest about Mursi, the only truly democratically elected president in Egyptian history. Ostasia: They won the mandate of democracym three times, you lost. Stop whining. And they would win again and again and again. I Know you don't like Islam...but so what? hundreds of million in this world do? There's no use to discuss anything with you two. It's quite clear what you are. Want to talk about Fascism? Then lets talk the one year we were being choked by Morsi and his MB gang. And still they are terrorizing us. Btw by making your names sound christian you're even LESS convincing, just saying. But, shows again the mindset & to what lengths you guys go on your propaganda train. Farida and Ostasia: The man is telling the truth, it seems you are bboth bankrupt, unable to discuss the real issues and clinging to the fascistic junta. Spot on, Ostasia! Expose them phonies! A Ikhwan in disguise with a christian name? Your tactics are just pathetic. Ahram is stating facts from the beginning til the end. You just don't like it.